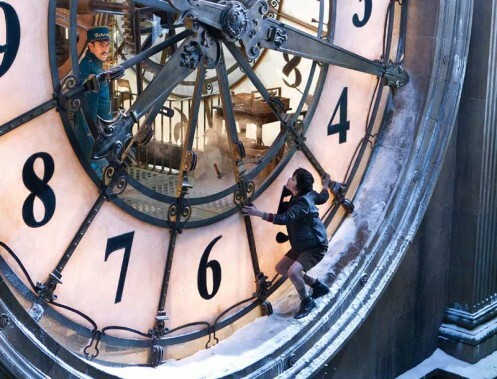 Congratulations to Set Decorator Francesca Lo Schiavo SDSA and Production Designer Dante Ferretti, recipients of the 84th Academy Award® for Outstanding Art Direction for the film HUGO! For full list of Art Direction Oscar® Nominees click here. See Francesca LoSchiavo's work on HUGO, below and with more detail in film decor. "It was really as if my drawings had come to life around me, except everything was bigger and more beautiful than I even could have imagined!" …Author/illustrator Brian Selznick describes stepping onto the sets of HUGO, Martin Scorcese’s cinematic version of his best-selling book. To create these wondrous scenes, Scorcese turned, as he often has, to Production Designer Dante Ferretti and Set Decorator Francesca Lo Schiavo SDSA, who transformed two stages into an enormous train station, reminiscent but beyond the Gare Montparnasse of the time. The main hall of the station filled a soundstage, running 150 feet in length, 120 in width and 41 in height. This overwhelmingly immersive environment allowed filming of all the movement, bustle and multiple stories and chases in 3D. And the enormous space had to be filled with shops, cafes, chandeliers, lamp posts, seating, heaters, posters and art…all of which were presented with actual period pieces plus many, many special reproductions designed by Lo Schiavo, enhanced to imbue a sense of magic. The team also made an exact re-creation of the glass studio of pioneer film-maker Georges Méliès, and re-produced some of his early films, complete with the sets, fabrics, costumes, paints and cameras of the time. French film scholar Rene Tabard recalled visiting the studio as a boy, when Méliès said, “If you’ve ever considered where your dreams came from, look around you. This is where they are made.” HUGO is proof of that. 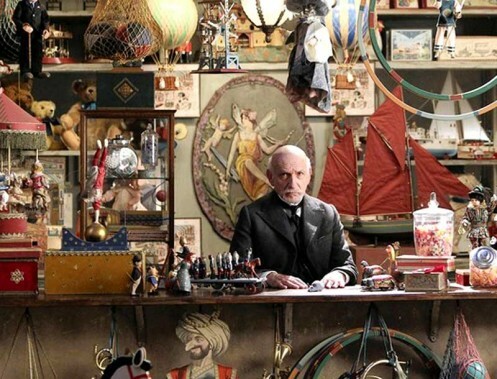 Georges Méliès [Ben Kingsley], film pioneer and illusionist, and now melancholy toy shop owner. Station Inspector [Sacha Baron Cohen] hunts for Hugo [Asa Butterfield]. 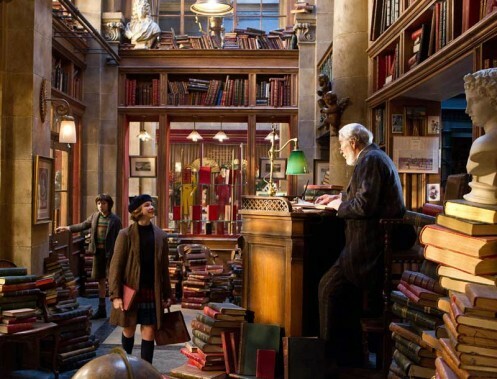 Hugo [Asa Butterfield] and Isabelle [Chloe Grace Moretz] enter the wondrous bookstore owned by M. Labisse [Christopher Lee]. 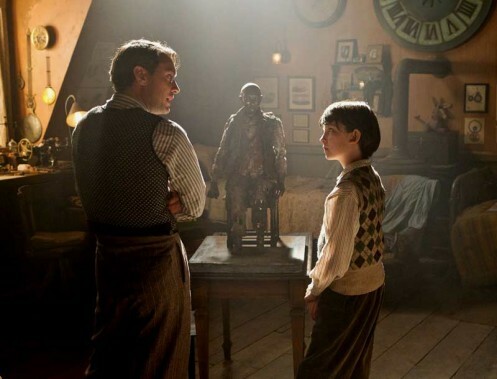 Hugo [Asa Butterfield] and his father [Jude Law]…and the automaton…in happier times. All photos by Jaap Buitendjik ©2011 GK Films LLC. All Rights Reserved.